Kick Off the Holiday Season at the Mag Mile Lights Festival! 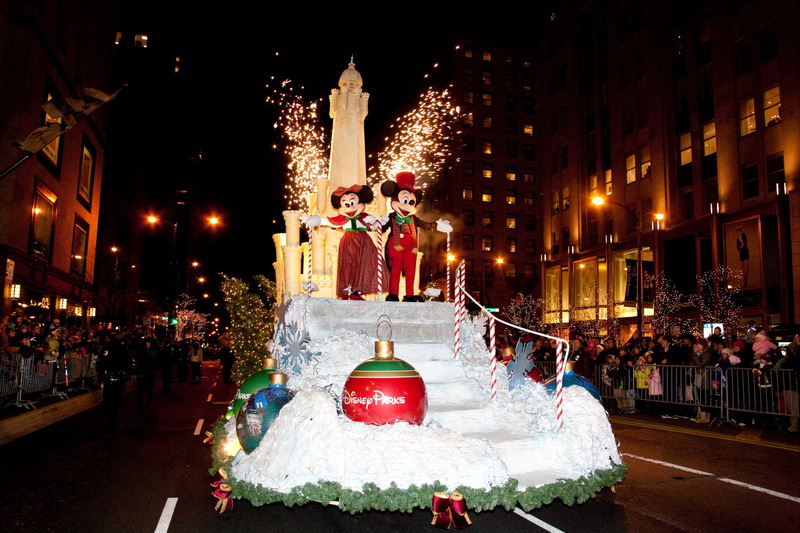 Start the holiday season with Mickey and Minnie and thousands of twinkling lights at the 20th Annual Magnificent Mile Lights Festival on Saturday, November 19, 2011. This season marks the 20th year of this celebrated Chicago holiday kick-off spectacular, and as usual, Mickey and Minnie will be the grand marshalls in a parade down our celebrated Mag Mile. Our family always tries to make it to this fun event. There is nothing quite like catching Mickey and Minnie, as they wave their magic wands, lighting tree after twinkling tree – it carries us all into the holiday spirit. Learn from our past mistakes: You simply can’t dress in enough layers. Bring blankets. Arrive early to catch the prime, curbside seating. Don’t even dare going by car or taxi: take public transportation. This year, more than 30 floats, giant balloons, exciting marching bands, celebrities, musical performers and, of course, Santa, will welcome the holiday season in style. More than one million (!!!) lights on 200 trees along the Magnificent Mile will be illuminated this magical evening. Head towards the Chicago river at the end of the parade to catch the festive fireworks. Pop by the Ritz Carlton (160 East Pearson Street at Water Tower Place) pre-parade, where you’ll find the Candy Man passing out hot cocoa and roasted chestnuts. Post parade, pop back into the hotel and toast the holiday season by witnessing the lighting of a 17-foot holiday tree decorated by American Girl Place (7:30 p.m.). Adults can enjoy a complimentary glass of champagne around the tree while children will enjoy hot chocolate. Make a weekend of the Lights Festival at the Ritz by taking advantage of the Experience More Package, which provides a 25 percent room rates savings when staying two nights. (Rates begin at $326 for Superior Room Accommodations and are subject to availability.). The Doubletree Chicago Magnificent Mile also offers a more affordable family package just in time for Mag Mile holiday shopping: though it’s not available during the weekend of the Lights Festival, the Winter Wonderfest Package includes comfy accommodations for two adults and two children (two-night minimum), a Navy Pier savings book complete with pier-wide dining and shopping savings; four one-day admittance passes for select rides/attractions through Winter Wonderfest on Navy Pier; complimentary overnight parking at the hotel (valued at $43/night), and an in–room movie to enjoy after an action-packed day, with rates beginning at $169/night. Many other hotels are offering Light Festival and Mag Mile holiday shopping special rates: check them out here. Here’s another tip: after the fireworks on the River (near Pioneer Court), walk over the bridge and head towards the Swissotel (323 East Wacker Drive), where you can warm up in the lobby and check out the huge gingerbread house. This entry was posted in Family and tagged Christmas in Chicago, family fun, holiday fun in Chicago, Mag Mile. Bookmark the permalink.